They recently received funding from Claire’s Project which allowed them to produce two new surf boards, one of which was produced in time to be tested out at an event held by the Wave Project. The board was used by about 10 children over the course of the weekend and even got used by a dad sitting in the seat holding his young daughter. Some great photos of the day were taken by Checkered Photography. You can find out more about CIC’s work here. If you think they can help you with a problem, contact the team at [email protected]. The CIC team recently tested their new surfing products at Poppit Sands in Pembrokeshire. 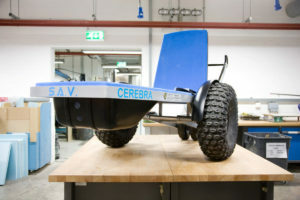 The team has developed a Tandem Surf Board and a Surf Access Vehicle (SAV) for use by surfers who could not use conventional surfing equipment so easily. In collaboration with Tonic Surf Therapy and Walkin’ on Water Surf School, the CIC team developed the SAV to help transport people from the car park across rugged terrain (sand dunes and rocks) down to the water’s edge to plunge straight into the sea. Once in around 50cm of water it is much easier to transfer onto a surfboard. The unique design of the SAV was developed with a UWTSD graduate Automotive Designer Ben Hammonds. It features a reclining back so that a surfboard can fit onto the device and to made transfers easier as the surfer can slide straight off the back. Many thanks to Shon Devey (Tonic Surf Therapy) and Kwame Salam (Walkin’ on Water Surf School) for their help in the development and to Tina Marie Evans for thoroughly testing the equipment! Life can often be hard for children with brain conditions and they are unable to join in with the fun that some of their able bodied friends can have. Our Innovation Centre is dedicated to designing and making bespoke products that can enrich a child’s life, giving them new experiences that wouldn’t otherwise be possible. By donating to our Christmas Appeal this year you can help our Innovation Centre bring fun and inclusion to a child’s life. This year our designers have developed two new products that will help disabled children to experience the thrill of the waves: a tandem surf board with a supportive “bucket” seat that can be used by disabled children whilst being controlled by a trained surf instructor and a Surf Access Vehicle. which enables wheelchair bound children to get to the water’s edge. Thirteen-year old surf enthusiast Kai Lewis has cerebral palsy following a stroke at the age of one. He recently helped to test the Innovation Centre’s latest designs. With this now, he is like the king of the sea, he can sit back, relax, and ride the wave. The first wave he caught was the biggest he has ever caught, and my heart was in my mouth. It was amazing and it opens up so many options, not just for Kai, but for other children with disabilities. Hopefully it’s going to get more children out of their wheelchairs, and for a parent of a child in a wheelchair the more you can get them out, the better. Please make a donation to our Christmas Appeal today and help put a smile on a child’s face. There are many more disabled children out there for whom the possibilities are endless, with a little help. 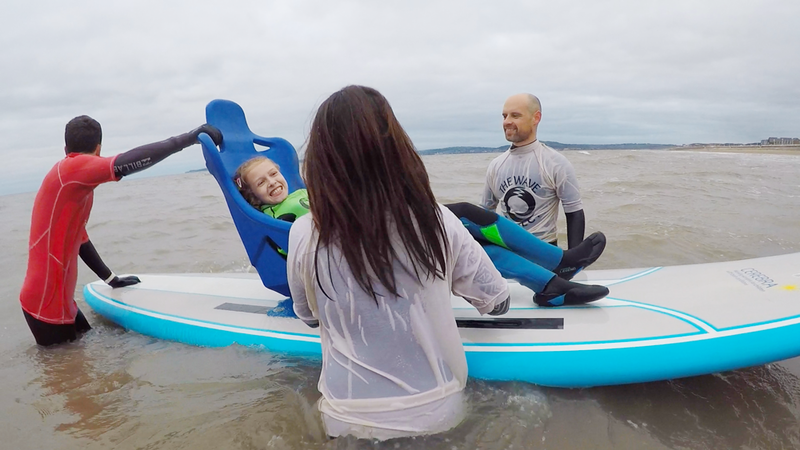 Our Innovation Centre have successfully tested two pioneering new surfing products for disabled children at Llangennith beach in west Wales. 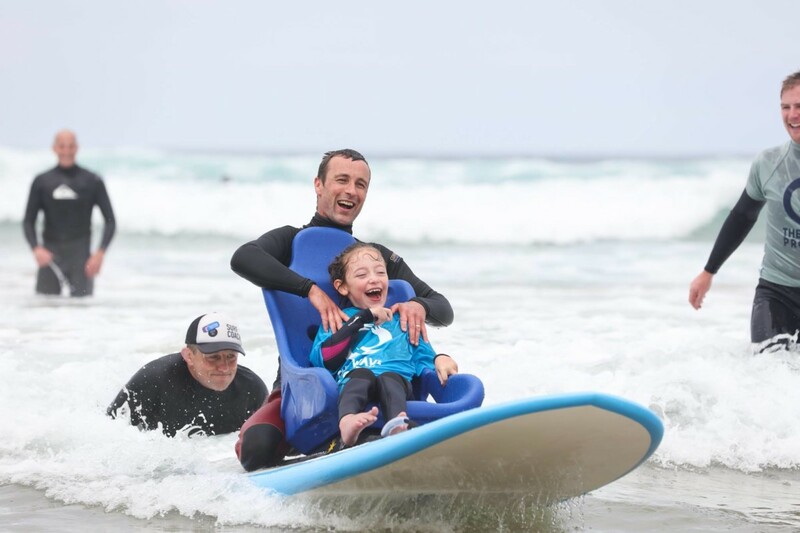 Over the summer our designers have developed two products: a tandem surf board with a supportive “bucket” seat that can be used by disabled children whilst being controlled by a trained surf instructor and a Surf Access Vehicle. Both products are for use by children with neurological conditions and have been developed with Surfability UK (surfing for disabled children) and Tonic Surf Therapy (based on the evidence of the effectiveness of surf/ocean therapy programmes in the UK and USA). 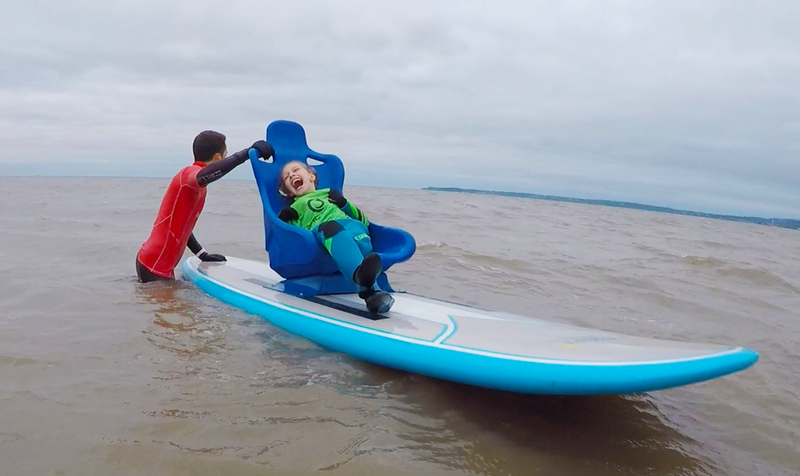 The team tested the new products at Llangennith beach and they were helped by thirteen-year old surf enthusiast Kai Lewis, from Port Talbot, who has cerebral palsy following a stroke at the age of one. Read more here about how CIC may be able to help your family. We are grateful to the University of Wales Trinity St David, Surfability UK, Roger Cooper Surfboards, Surf Tonic Therapy and Walking on Water Surf School for working with us on this project. All photographs used with kind permission of Mark Griffiths. Ross and the team at the Cerebra Innovation Centre are still in the early stages of trying to make these products available to surf clubs across the country and you can help make that a reality! You can donate below, by calling our fundraising department on 01267 244221 or to donate by text, just text SURF15 and the amount you would like to give to 70070. Thank you for any support you are able to give. 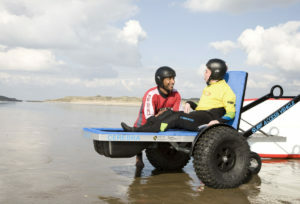 One of the new products being pioneered by CIC this summer has been the new Surf Access Vehicle (SAV). Being developed in conjunction with Surf Tonic, a West Wales based surf school which specialises in surfing for people with various conditions, the SAV is aimed at transporting people from the car park to the water’s edge, and then into the water to aid transferral onto a surfboard. The cool design was created in partnership with a student who did a short internship with CIC called Ben Hammonds. The concept is designed such that a person of any size, any ability and condition, can sit in the seat comfortably and with dignity, be transported across rough and sandy terrain and then plunge into the waves. At this point, the seat can lay flat, allowing the surfer to slide off the SAV and be transferred onto the board. Surfing is well documented as a great treatment for many conditions. Being outdoors, the fresh air, the sound and the motion of the water all conspire to make us feel great, so the more people who get to experience this fun sport the better. And with the length of coastline we have in the UK we are spoilt for choice! The SAV is nearly complete after a long summer of development, but we hope that it will be in service during September and due to its superior materials and construction should see many years of use. We look forward to updating you with stories of its success and some photos of the real thing in action! Another surfing product that CIC have been asked to assist with has been a tandem surfboard which has a seat on it. This enormous surfboard can be ridden by two people: an instructor, who will paddle, surf and control the board, and a surfer who will sit in the seat and experience all the fun and motion of the waves. CIC surfers, Ross and Dan designed and developed the board in collaboration with Ben Clifford from Surfability in Swansea, and Roger Cooper surfboards in Cwmafan, near Port Talbot. The board measures 12 ft long, and 36 inches wide and has an adjustable bucket seat from a racing car. The seat was very kindly made and donated by Jamie McDonald from Techneat Tanks. 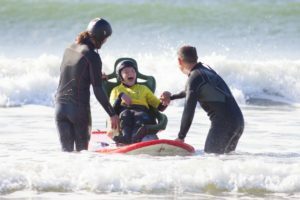 The board has been made for Kai, a local Swansea surfer with Cerebral Palsy, but it is hoped that as many as 50 children will benefit from the board each year and with a life expectancy of 5 years, there will be many hours of great surfing to be done!